Tokyo, November 14, 2014 - Hitachi, Ltd. (TSE: 6501) announced the development of a battery technology that doubles the driving distance of electric vehicles *1. Specifically, the electrode is twice the thickness of conventional batteries, thus increasing the amount of lithium-ion's available for charging and discharging and increasing the energy density. Another feature is optimization of the distribution of the active material within the electrodes to promote lithium-ion mobility and increase battery power density. That was achieved by using a newly developed technique for three-dimensional visualization of electrode structure to clarify lithium-ion movement. Silicon-based anode materials are capable of charging and discharging more lithium ions than conventional carbon-based materials, but they have a short service life because they are easily separated from the electrode. We have developed a technique for strongly binding silicon materials to the electrode to suppress that separation, thus achieving the service life that is about the same as carbon-based materials. Another problem with conventional anode materials is that application of a high voltage causes decomposition of the electrolyte, shortening the service life. We were able to overcome that problem and extend lifetime by coating the cathode surface with oxide. By applying these solutions, we were able to achieve high energy density and power density together with a long service lifetime, resulting in batteries that can double the driving range of electric vehicles. Electric vehicles hold promise as environment-friendly vehicles that do not emit carbon dioxide. On the other hand, widespread use of such vehicles requires that the driving range be extended by using lithium-ion batteries that have both high energy density and power density and a long service life. Hitachi has solved those problems by developing technology that achieves an energy density of 335 Wh/kg (higher than previous performance by a factor of 2.6 *2) and a power density of 1600 W/kg for the 30 amp/hr-class cell that is actually used for electric vehicles. That achievement makes it possible for electric vehicles to drive twice as far on one charge. The features of the technology we developed are described below. Increasing the energy density requires thicker electrode layers to provide more lithium ions for charging and discharging. However, that can result in an uneven distribution of the active material through which the lithium-ions exit and enter, which impedes lithium ion mobility and decreases power density. To address that problem, we developed a technique for 3-D visualization of the electrode structure to clarify the characteristics of lithium-ion movement and optimize the active material distribution to achieve high power density. Increasing the energy density requires increasing the amount of lithium ions that are available for charging and discharging. At the anode, carbon-based materials have been widely used as the active material, but silicon-based materials are superior for their ability to allow lithium ions to enter and exit. A problem with using silicon-based materials is that the particles expand and contract in the repeated charge-discharge cycles, which results in separation of the particles and a reduction of lifetime. We overcame that problem by applying a conductive surface treatment to the silicon material and using a strong binder that tightly binds the particles of the silicon material together *3. By doing so, we were able to achieve a lifetime that compares with anodes that use the conventional carbon material. Hitachi will continue with R&D to achieve practical lithium-ion batteries that apply the elemental technology we have developed by 2020. The work reported here was done as a part of the Applied and Practical Lithium Ion Battery Development for Automobile and Multiple Application Project of the New Energy and Industrial Technology Development Organization. 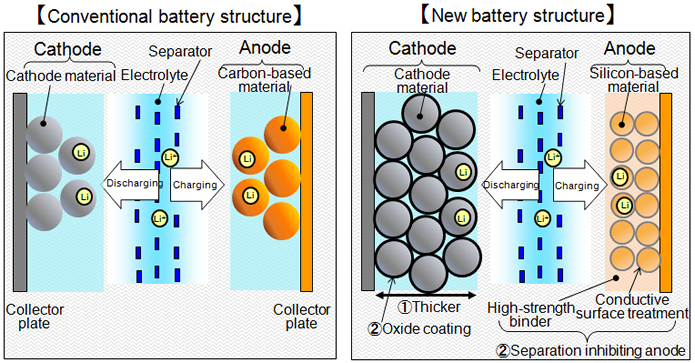 The results of this research will be presented at the 55th Battery Symposium, which is to begin on November 19, 2014 in Kyoto, Japan, and is organized by the Committee of Battery Technology and the Electrochemical Society of Japan. Calculated on the basis of an electric vehicle battery weight of 150 kg and power consumption of 114 Wh/km. Based on data from joint participation with the Hitachi Vehicle Energy Company of the Hitachi Group in the Research and Development for High-Energy-Density Lithium Ion Battery with High-Power Capability Project commissioned by the New Energy and Industrial Technology Development Organization. Verification testing that involved 50 charge-discharge cycles was completed.